Hvolsvöllur is a small town in the south of Iceland about 106 km to the east of Reykjavík.It is situated in the inland swamps of Landeyjar, in the municipality of Rangárþing eystra and has, as of January 2015, 934 inhabitants.OverviewThe name of the town literally translates to "Hillfield". Kick off your visit on the 5th (Sat): tour the pleasant surroundings at Icelandic HorseWorld and then admire the sheer force of Seljalandsfoss. For where to stay, traveler tips, other places to visit, and tourist information, read Hvolsvollur itinerary builder. London, UK to Hvolsvollur is an approximately 9.5-hour flight. Plan for a bit cooler temperatures traveling from London in August, with highs in Hvolsvollur at 14°C and lows at 11°C. 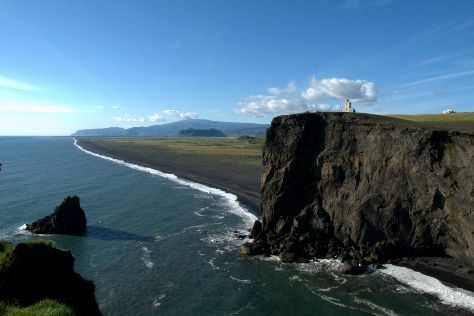 Wrap up your sightseeing on the 5th (Sat) to allow time to drive to Vik. On the 6th (Sun), take in the dramatic scenery at Skogafoss, then take in the dramatic natural features at Myrdalsjokull Glacier, and then enjoy the sand and surf at Black Sand Beach. Get ready for a full day of sightseeing on the 7th (Mon): take in the dramatic natural features at Dyrholaey and then kick back and relax at Reynisfjara Beach. For more things to do, photos, traveler tips, and tourist information, go to the Vik online itinerary creator. You can drive from Hvolsvollur to Vik in 1.5 hours. Alternatively, you can take a bus. Wrap up your sightseeing on the 7th (Mon) to allow time to drive to Geysir. Geysir tourism revolves around a famed geyser, which goes from very calm to extremely volatile depending on the subterranean seismic activity at the time. To find more things to do, maps, and other tourist information, read Geysir vacation planner. Traveling by car from Vik to Geysir takes 2.5 hours. Alternatively, you can take a bus. August in Geysir sees daily highs of 14°C and lows of 11°C at night. Wrap up your sightseeing by early afternoon on the 8th (Tue) to allow time for the car ride to Reykjahlid. Eschew the tourist crowds and head to Myvatn Nature Baths (Jardbodin vid Myvatn) and Dettifoss. 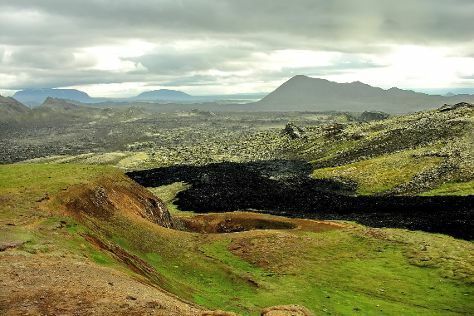 Visiting Lake Myvatn and Krafla Lava Fields will get you outdoors. To see reviews, where to stay, more things to do, and other tourist information, read Reykjahlid trip builder. Traveling by car from Geysir to Reykjahlid takes 6.5 hours. Alternatively, you can take a bus. Traveling from Geysir in August, Reykjahlid is a bit cooler at night with lows of 7°C. Wrap up your sightseeing on the 12th (Sat) to allow time to travel to Reykjavik. Reykjavik, the world's most northerly capital, effortlessly combines small-town charm with heaps of big city energy. Start off your visit on the 12th (Sat): pause for some serene contemplation at Hallgrimskirkja, then examine the collection at The Settlement Exhibition, and then see some colorful creatures with a scuba or snorkeling tour. Get ready for a full day of sightseeing on the next day: see the world from above with a helicopter tour and then soothe aching muscles at some of the top local wellness centers. To find photos, where to stay, more things to do, and other tourist information, read our Reykjavik travel itinerary planner. You can do a combination of bus and flight from Reykjahlid to Reykjavik in 4 hours. Other options are to drive; or take a bus. Expect a daytime high around 16°C in August, and nighttime lows around 9°C. Cap off your sightseeing on the 13th (Sun) early enough to travel back home.